This summer our work to us to Chicago for six weeks (topic for another post), the starting point of historic "Route 66". Back in Los Angeles, I decided it'd be interesting to walk along the last final section of Route 66 that goes through Los Angeles and Santa Monica. Here's a map of the first leg of my walk. 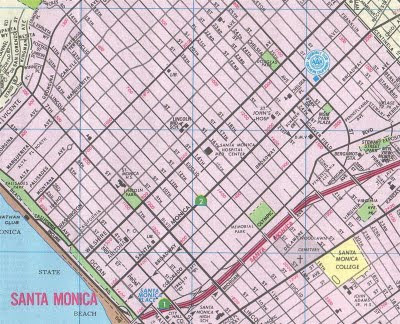 Santa Monica Blvd (which parallels Wilshire Blvd. through the city of Santa Monica) also has the designation of "California State Highway 2" - although no one calls it that.